Description: The two pilot-engineer teams that flew the SR-71 aircraft at the NASA Ames-Dryden Flight Research Facility (later, Dryden Flight Research Center), Edwards, California, are, from top of ladder, pilot Rogers Smith, flight engineer Robert Meyer, pilot Steven Ishmael, and flight engineer Marta Bohn-Meyer. The Meyers are the first husband-wife team of aeronautical engineers at Dryden on flight status. 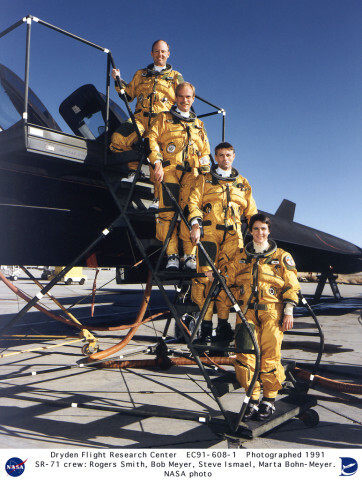 Keywords: SR-71; Dryden Flight Research Center; U.S. Air Force; sonic booms; Jet Propulsion Laboratory; LASRE; YF-12; Dave Lux; Steve Schmidt; Lockheed Skunk Works; Lockheed Martin; Pratt & Whitney; Rogers Smith; Robert Meyer; Steven Ishmael; Marta Bohn-Meyer; Blackbird; high speed research; supersonic research; Mach 3.